eBooks and iPads and Blackberries, oh my! At my present university the periodical magazine features a point-counterpoint discussion in each issue. 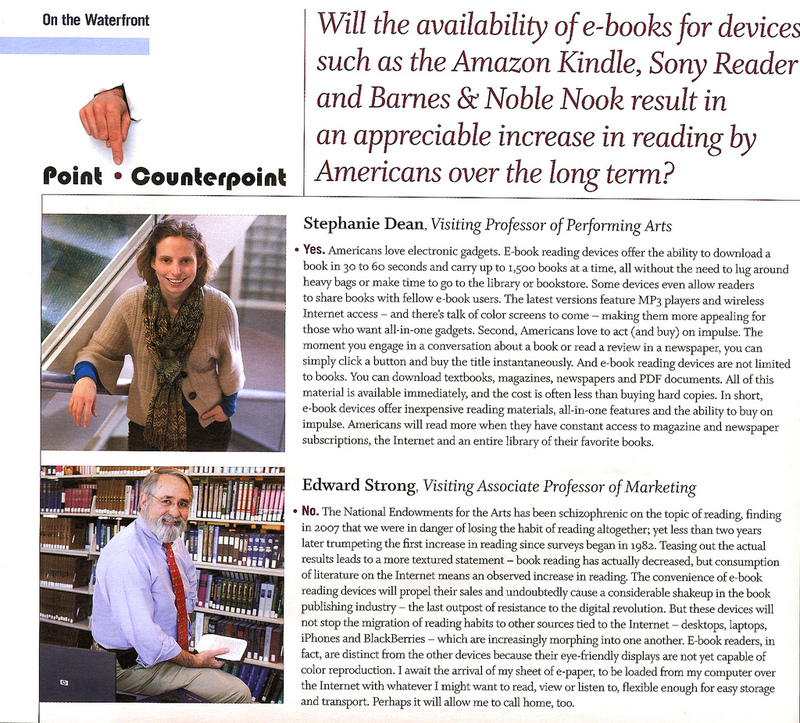 This time the topic was whether the coming-of-age of eBooks would result in increased reading; to kill the suspense, I took the con side while a professor of performing arts took the pro side. We made our arguments (in writing) last November as Barnes and Nobles’ Nook was in delayed shipping and well before Steve Jobs bewitched us all with the iPad. So I bring you a copy of the debate as it was printed on the same day that Amazon announces that its “Kindle for Blackberry” app is ready – and I’ve already started reading one of my Kindle books on my Blackberry, thank you. I can now read my Kindle books on two desktops, one netbook, my Blackberry and my Kindle. Fantastic. Click on image for easy-to-read size. We debate whether eBook readers will increase reading over the long haul.